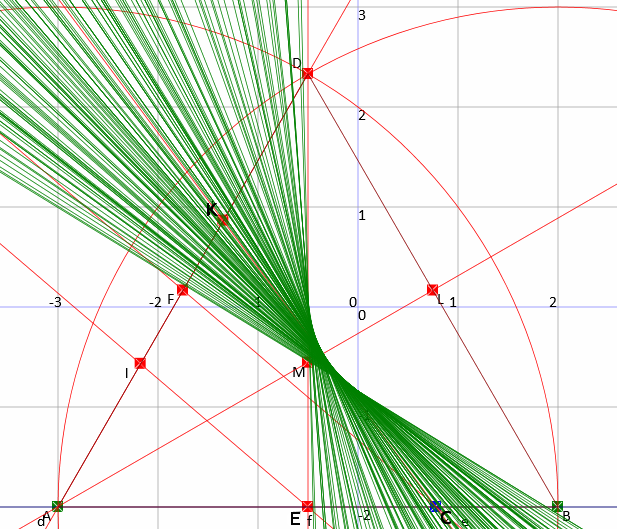 Analytic (coordinate) geometry has its good points, but elegance is not one of them. This all started with a post by Maya Quinn (mathwater.wordpress.com) on problem solving. An oblong piece has been removed from an oblong cake (why? who did that? ).The problem was to cut the remainder of the cake into two equal parts. Lots of solutions, one in particular was very imaginative. This led me to another problem – what if the cut-out piece was triangular? In view of one of the solutions to the first problem I decided that the triangle should be chopped in half. Not as simple as chopping a rectangle in half ! So, with Polya at my side (he’s been there since 1962) I decided that an equilateral triangle would be a reasonable starting point, as at least it was obvious that there were a few lines through the centroid doing the job (the medians), so some generality was still around. Here is the equilateral triangle, nicely resting on the x axis, side length 2, top point on the y axis. This allowed me to find the coordinates of the point H and locate it correctly on the line. 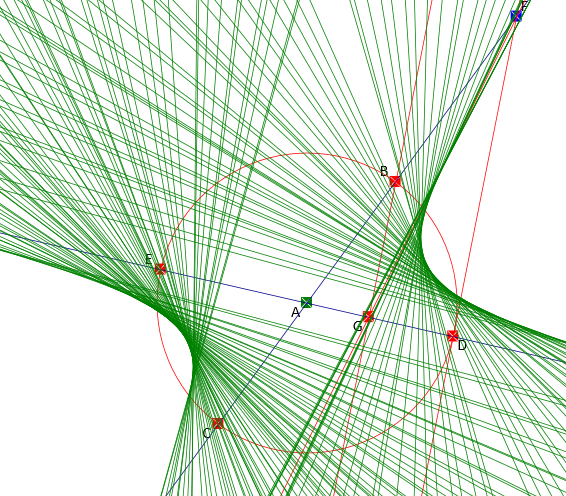 I then joined the points and by moving G the line moved, and I tracked it, shown in green below. The visible curve is called the envelope of the lines, and it (obviously) touches the medians. The complete envelope of the bisecting lines consists of two more sections, making a “concave”triangle with the centroid in the middle. 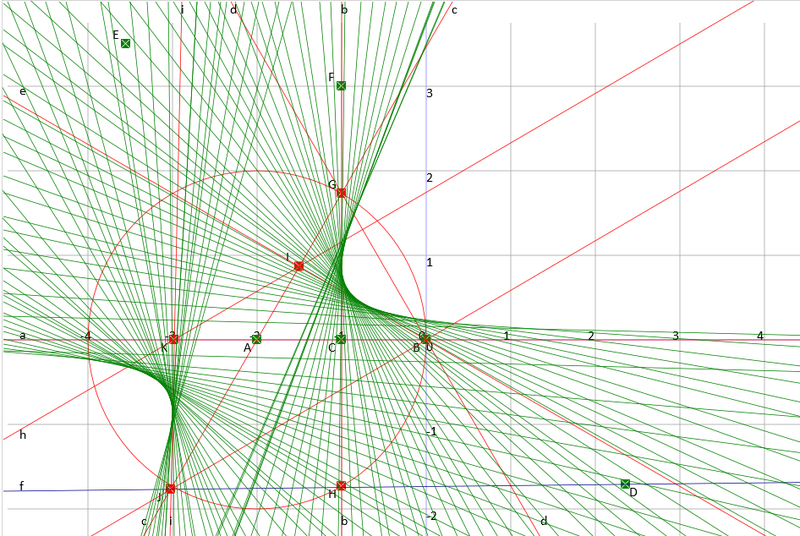 This produced X=1+x and Y=2-y, and to my surprise the resulting equation was Y=2/X, or XY=2. The significance of this last equation escaped me at this point. A complete hyperbola, and, not only that, its asymptotes appear to be sides of the equilateral triangle. (Which when you think about it is not completely unreasonable !). The triangle is ADF and the halving line is BG. Yes ! Same result ! At which point I saw a bit of light, and thought that “XY=2” does not involve angles at all. Then straightaway all was revealed. You can draw the picture ! which reduces to (XC/AC)*(YC/BC)=0.5, and this does not involve the angle. 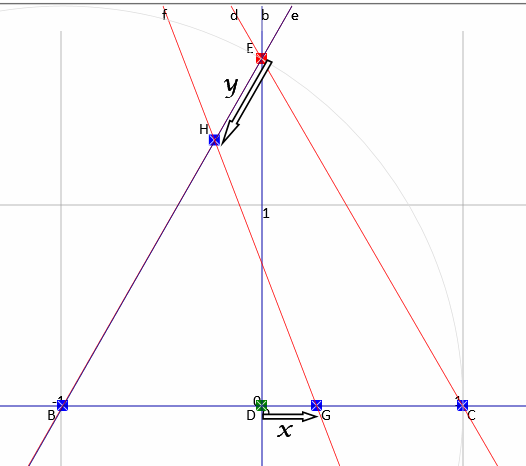 Pure speculation suggests that this result may have some connection with the way that the angle bisector of an angle in a triangle divides the opposite side in the ratio of the two adjacent sides.